The Wright Way—smart, simple & fun……. success guaranteed! My name is Alan Wright…I am a local senior golfer and discount golf coach. The purpose of this web page is to introduce to the internet world a special service that I provide for the Tucson Metropolitan Area senior golfers. In addition to “My Confidence Course” that I provide online for golfers all over the world, I am taking this opportunity to announce a really fun golf project just for you that I call….“My Pop, Pitch, and Putt Project,” or FUNKY GOLF! What is this project and what does it mean to You? I have a “smart, simple, and fun” golf program that will help you play better golf in less than thirty (30) days! 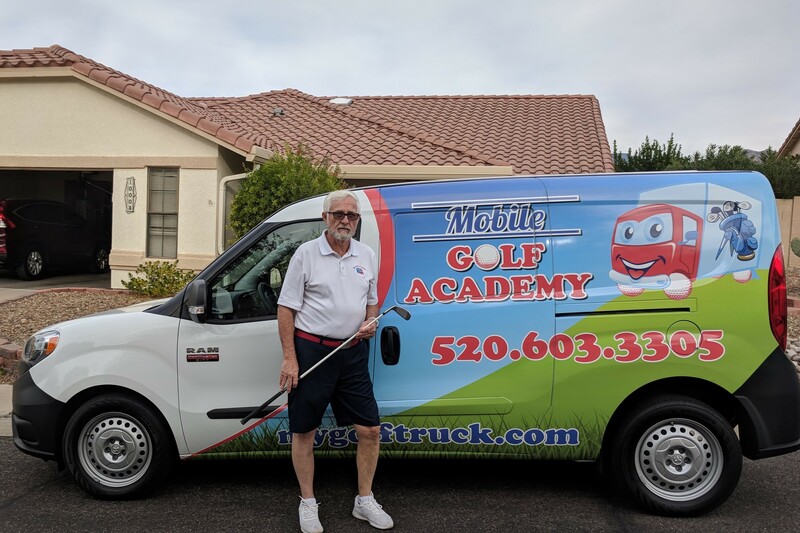 If you live in the Tucson Metropolitan Area, I will come to your home, or a local location of your choosing, and provide coaching to maximize your golf game in a way that will end your frustration and increase your confidence. The bottom line, fellow senior golfers, is that I will make it possible for you to use just one (1) golf club (instead of fourteen) and take five (5) strokes off your nine (9) hole game, or ten (10) strokes off your eighteen (18) hole round of golf, if you insist on playing 18. AND, I will do it in a very inexpensive way with a money-back guarantee. Yes, that is right, I will give you your money back if you are not satisfied with my program. There are three basic parts of my “Funky Golf” coaching project: pop, pitch, and putt. I will briefly describe each of these three parts here for you right now. Distance is a problem for most senior golfers…for a variety of reasons. POP is my solution to this problem. As we age, sometimes with physiological issues that slow down our swing speed and limit our flexibility, it is wise to alter our swing in such a manner as to focus on accuracy and consistency rather than maximizing distance with our club selection. I will coach you to select one (1) golf club and show you how to use it to get you off the tee and down the fairway to set-up an easy approach shot to the green. This golf club is used to “pop” the golf ball, as opposed to “hit” the golf ball The swing and impact is distinctively different than the classic swing and impact taught by most PGA professional golf instructors. (I am not a PGA professional golf instructor) I am a golf coach. What is unique about the golf swing I will coach you to develop is simply an individualized single plane swing that is designed just for you based upon your personal characteristics. I believe the pivotal shot in the game of golf is the approach shot. There are many types of approach shots taught by traditional golf instructors all over the world and for many different situations…all of which help sell golf clubs. Since I am not selling golf clubs, I coach one (1) simple approach shot with one (1) golf club that will get the job done in a “smart, simple, and fun” way that I call the Wright Way. The challenge for my coaching approach with senior golfers is to overcome the fact that the same people that profit from designing the courses, selling golf clubs, and providing instruction on how to use them, are really good at what they do. BUT, it can be really a lot of fun to challenge the system and play well even as we get a little older and wiser. It is easier to do than you might think it is. Naturally, I coach a different putting stroke than the traditional professional instructors teach. This stroke is consistent with the “pop & pitch” strokes making putting part of the one golf club “Funky Golf” approach to recreational golf. This is probably a good point to mention that (I believe) coaching is different from “instruction.” My coaching program emphasizes preparation and practice for better performance more than traditional “swing instructors” generally do. I will coach you to develop a putting stroke more consistent with your “pop & pitch” strokes that is more balanced and easier to replicate for accuracy and distance control. It is easier to practice and help you obtain more immediate and lasting results.